The North America market for veterinary radiology systems is highly competitive in nature with a presence of several players operating in it, states a market intelligence study by Transparency Market Research. In 2015, the prominent players, namely Fuji Medical Systems, Sound-Eklin-VCA Company, Canon, Inc., and Idexx Laboratories, Inc. held a share of around 65% of the overall market. These players in the market are emphasizing on improving their distribution channels in order to reach a large percentage of audience and gain a niche in the market. The rising number of collaborations and mergers in the North America veterinary radiology systems market is estimated to supplement the growth of the overall market in the next few years. 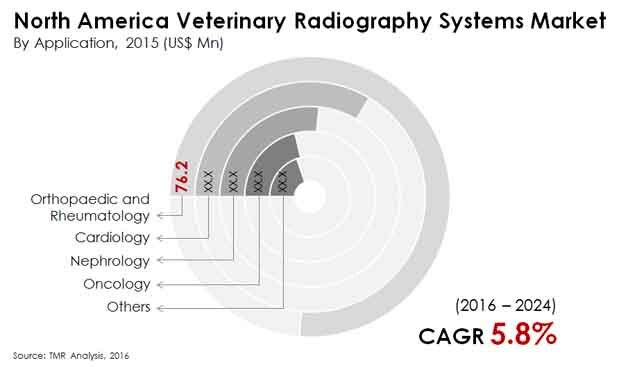 As per the research study, in 2016, the North America market for veterinary radiology systems was worth US$187.7 mn and is anticipated to reach a value of US$294.5 mn by the end of 2024. This market is expected to register a healthy 5.80% CAGR between 2016 and 2024. From a geographical viewpoint, the North America market for veterinary radiography systems has been classified into Canada and the U.S. In 2015, the U.S. led the overall market with a massive share of the market. As per the research study, this segment is estimated to maintain its dominant position throughout the forecast period, with the increasing number of consumers who are adopting pets. On the other hand, Canada is anticipated to witness a sluggish growth in the next few years and register a steady growth. The growing awareness regarding the health of pets is anticipated to encourage the growth of the North America market in the next few years. On the basis of application, the North America market for veterinary radiography systems has been divided into oncology, cardiology, orthopedic and rheumatology, nephrology, and others. According to the research study, the orthopedic and rheumatology segment is estimated to lead the North America veterinary radiology systems market throughout the forecast period. The rising number of bone injuries during sports and other training activities is expected to boost the demand for veterinary radiography system devices across North America in the coming years. The increasing rate of adoption of pets and the rising spending capacity of consumers for pet care are estimated to encourage the growth of the North America Veterinary radiography systems in the next few years. In addition, the rising focus of key players on introduction of new therapeutics and devices is predicted to supplement the growth of the overall market in the coming years. The rising number of sports and adventure activities for animals is considered as a key factor fuelling the growth of the overall market in the next few years. Furthermore, the rising cases of broken necks, broken legs, heart attacks, and fractured skulls among pets is projected to enhance the demand for advanced veterinary radiography systems in the coming years. Moreover, several initiatives taken by governments to ensure safety and health of pets is likely to generate promising opportunities for the growth of the market in the near future. The North America market for veterinary radiography systems is predicted to witness several challenges throughout the forecast period in the coming years. The lack of public insurance for pets is likely to restrict the growth of the overall market in the coming years. Moreover, the high cost of these systems is likely to hamper the growth of the market. Nonetheless, technological advancements are anticipated to generate promising opportunities for the key players operating in the North America veterinary radiology systems market in the next few years.